Max Air Limited, a wholly Nigerian owned airline and a new entrant in the country’s much-harried airline business, last week completed its maiden Port Harcourt – Abuja flight. The Boeing 737 wide-body aircraft landed at the Nnamdi Azikiwe International Airport, Abuja at 11:38pm, after so much delays in leaving the Port Harcourt International Airport, for a flight that was initially meant for 5:45pm. Tens of passengers who booked the flight were told that the aircraft was being expected from the Murtala Mohammed International Airport, Lagos. They waited for several hours at the Port Harcourt Airport until 10:09pm when they were told to proceed for boarding. Raymond Omdiagbe, the general manager, operations and business development, Max Air told our correspondent who was part of the inaugural flight, in an exclusive interview that the delays were mainly operational issues which he placed strictly on the doorstep of Nigeria’s civil aviation regulator, the Federal Airports Authority of Nigeria (FAAN). He said they were fully equipped and prepared for domestic flight business in the country, having been into commercial airline industry since 2006 when it began mainly hajj operations. He said Max Air was incorporated in March 2003. 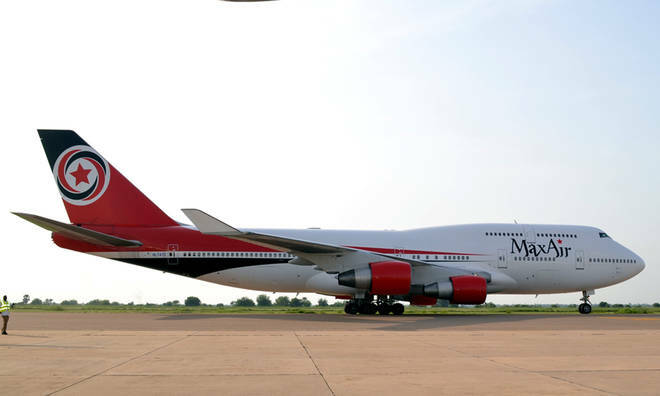 Omodiagbe claimed that Max Air has the biggest aircraft fleet in Nigeria, as it has eight Boeing 747 aircraft each with capacity of 560 passengers. “In July this year, we started domestic operations with three 737 – 300 aircraft with Kano, Abuja and Lagos. By September we added the Lagos-Abuja-Maiduguri routes. “Today, here we are with the Abuja-Port Harcourt twice daily flights, as well as Yola once daily flight,” he said. Max Air’s unique selling point (USP) are its special inflight service and customer care, as well as its advantageous prices, Omodiagbe said. However, the company’s first foot in Port Harcourt was so improperly placed on that Monday, 5 November, as virtually all the passengers on that maiden flight were completely dissatisfied with the unprecedented five-hour delay on a supposed inaugural flight when all pre-arrangements would have been done before stepping out. In a country replete with a bureaucratic-infested airline system, flight delays, cancellations and short changing of passengers have remained anything but credible. But Omodiagbe clearly blamed FAAN for their terrible maiden flight ordeal. According to him, “government should create the right environment for airlines to operate smoothly. We are not asking for money to be given to us by government, but for administrative measures to be put in place to aid the airlines business. “In this era of technology, things have to be done with technology – fast and perfect in Nigeria – not with hurtful delays and manually. It sets the nation backwards, whereas other countries are advancing with tech savvy. It’s quite worrisome and hurts business,” he said. Both he and the cabin crew kept apologising to the passengers until the aircraft touched down at the Nnamdi Azikiwe Airport shortly before midnight. They promised to make it up to the passengers when next they boarded the airline.